It is really weird when the concept of environmental responsibility is not considered a dirty word in the culture. The largest grocery chain Tesco labels most of the their food with the carbon footprint on the packaging. (Yes, delicious avocados have a pretty high footprint since they are coming from South Africa and the grapefruit juice for my sore throat is from Israel.) The idea of Walmart having carbon footprint reduction as their main advertising would just be unheard of; but the reality of living on a foggy island is that it's going to encourage environmentalism for cost reason more than anything else. London is compact. So instead of having 7-11 or bodegas for convenience stores the grocery chains have tacked on code words so you know how big the store is. For Tesco it goes express (convenience store), metro (this is how big grocery stores were when I was a child), superstore (normal grocery store), extra (in the U.S. a superstore, where they sell non-food items). Other chains like Sainsbury's and Waitrose have their own code words that I am still trying to figure out. Growing up in California I have always liked Mexican food. I had heard getting Mexican food here was going to be a problem. I have found a small shelf though in the local grocery, and the California craze of "wraps" has spread further than just the United States so it is pretty easy to get tortillas. The only mexican fast food I've found here are quesadillas and nachos and they did get some of the words wrong calling the hot sauce creole sauce; and while it isn't the best (They add sugar and malt vinegar to the salsa) it does satisfy the craving I have for now. It is bizarre, but I can tell which foods are subsidised by the government differently. In the U.S. it is the corn and soy so most of the cheap food is the prepackaged stuff. Here, I am guessing, it is the wheat and milk because it only costs £1 for loaf of bread or 4-pint jug of milk. This makes me happy since I don't go for much pre-packaged food so my food bill should be cheaper and I can drink plenty of milk. Of course I feel the need to try the local food too. 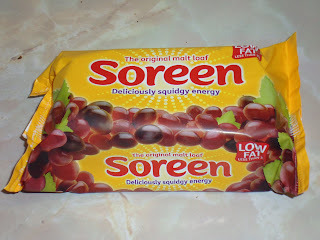 So, the first one was Soreen malted bread. It caught my eye because it said it was full of squidgy energy. It was quite tasty; a cross between raisin bread and an energy bar, I've already bought another loaf (their small mini-loaf size). The other food I've tried was All Day Breakfast in a can. It is not as bad as it sounds. The normal English breakfast is baked beans, roasted mushroom and tomatoes, with as many types of meat on the side as possible. So in the can was the baked beans with mushrooms but the meat was a couple of pieces of sausage and hotdogs which I've never had before when ordering an English breakfast. It was OK, but I don't think I will be buying it again. When I saw Wensleydale cheese, I had to try that too (Wallace and Gromit reference). It tastes very similar to Mexican Queso Blanco so I was quite happy. It seems like a lot of the dishes that British food are known for are greasy. For the first week I was eating a lot of prepared or frozen food and I'm sure it is the same in the U.S. but after every time I ate it felt like I needed a nap. Between the sausage, ham, bangers, and sautéed mushrooms for breakfast, the Cornish pasties for lunch, and the frozen dinners I got that billed themselves as "True British dinners". I guess it has just been a while since I have eaten like this, and to judge a country's food by what is in the frozen section of the grocery store is unfair. But the U.K. has a problem with obesity too, I'm just surprised that they are not on par with the U.S. if this is the normal diet.